Jypyä Pop (Turku, Finland) on 19 July 2017 in Lifestyle & Culture and Portfolio. The hay is poured on an old horse-drawn mower near the city center. When the hay is poured, the town invites volunteers to raise the hay to the ground to dry. When the job is done, thank you for the small serving and a very nice feeling that you can be involved in doing this work in the traditional way. Relaxing pic. I want to go there too! @Wayra: Thank you. Finnish herniation involves a lot of romantic traditions. Those are pretty cool mowers. However, a neighbour of ours, when I was a young lad, cut his finger off on one of those. So, be careful! @beach: Yes, I stay away from it. Glad to see that some traditions are kept alive today!! Great capture! I wondered why he was dressed so well to be working the plow - he is a volunteer! This is a superb image with lovely light. A very warm homely rural scene. Nicely documented. Ahh !! A good way to do it. This is a wonderful scene. 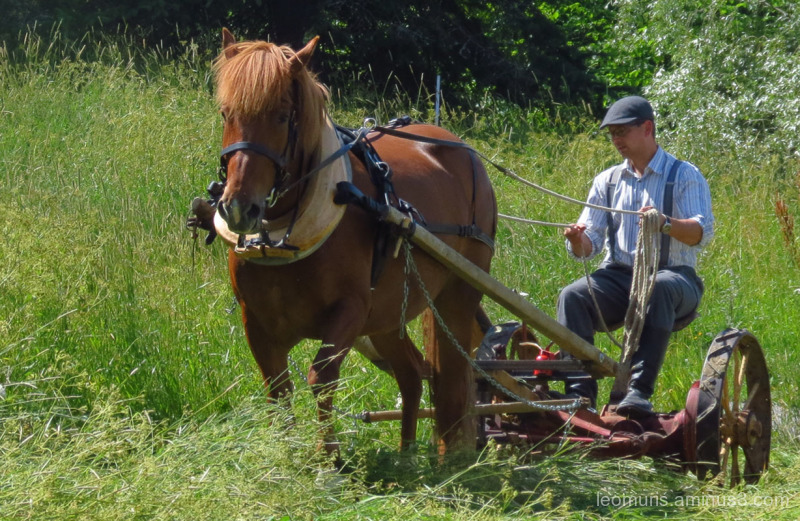 A beautiful shot of this horse drawn mower.